" ... The use of neuroscience in POPAI's 2012 Shopper Engagement Study made it possible to evaluate shoppers' behavior, visual fixations and emotional engagement almost as if in slow motion, revealing not only a time-locked breakdown of their decision-making processes but also new insights about the impact of displays. Data analysis is ongoing, but so far the findings suggest that endcap and floorstand displays affect shoppers differently than previously thought. By outfitting shoppers in unobtrusive gear consisting of an eye-tracking device, cameras and electroencephalography (EEG) equipment, "we're creating neuro movies, in a sense, and those videos show us that displays play a major role in stimulating product category consideration," says consultant and lead researcher Lily Lev-Glick, principal at New York-based ShopperSense. The neuroscience was used along with traditional methodologies. ..... " Full Article. Paul Hare's blog: The Numbers Don't Lie: Statistical analysis of evidence in the world of sports. Moneyball and beyond. In NYT Technology: Snack foods are a natural intersection place between social technology and people. This article addresses work underway and how retailers and manufacturers are participating. Also how consumer research can be done in the same space " ... Frito-Lay is using a Facebook application to develop ideas for potato chip flavors. Users are asked to submit flavor suggestions and click an "I'd eat that" button to register support for other users' proposed flavors. "It's a new way of getting consumer research. We're going to get a ton of new ideas,” says Ann Mukherjee, marketing chief at Frito-Lay North America. ... "
CW article on how a survey shows most companies have no plans for big data analytics. I will go further to say that most companies have coherent plans for any analytics at all, beyond the most trivial overview. Lots of opportunities here. Says a recent survey presented in Baseline. But they clearly use the Internet a great deal, even for very important decisions, when they should go elsewhere for advice. Very Good piece from HBR on the rapid introduction of big technology change in the large enterprise, including some consumer package goods examples. We experienced this in particular during the rapid integration of Web technologies in the 90s. It required the training and re-training of skeptical executives and eager new employees. That move was eventually done successfully. Today even that has changed as new employees bring in the technology for their own use. That was not the case in the 90s. But some changes are still under way. How do you address the inherent risk? Some direct advice in the article. An idea we experimented with. In particular as new hires come on board expecting to communicate broadly with a social network. This makes some good points about what they should look like to be used and also be useful for your goals. This idea seems to be gaining some interest lately. A favorite topic of mine: Elements of the design and its story place the design in a human context. An overview. Saw an IBM presentation on this earlier this year. All analytics can be used predictively, so the idea is not new. Simple block crime occurrence charts have been used for a long time. The ability to leverage a wealth of data and do that quickly is new and being used in many areas today. How historical technology adoptions have changed global economies. In HBS Working Knowledge. This has been known for a king time. Somewhat counter indicative at times. Some very extraordinary advances in technology have not necessarily led to economic advances due to the context of the regions themselves. Is this still the case, or have advances in communications changed that? Fascinating historical data. In FlowingData: A very dense visualization of the Internet today. A visually intriguing viz, but also an example of many opportunities missed. As the article suggests, some of the dimensions included do not apparently have any meaning. So they can be labeled as clutter. And clutter is never good. Would a sorted list, by traffic volume, be better? We worked for some time with this kind of bio simulation capability that came from UCSD. Their BioNome Research Center now appears to be defunct. (Can anyone provide some information on that?) The object was to understand as early as possible what the effects of alternative pharmaceuticals might be. Now more ambitious plans at Harvard. Fascinating piece on innovation from PARC. Which remarks on Steve Job's famous visit to PARC labs for a demonstration of the 'windows' concept and mouse pointing and how it ended up in other places. And how such innovations like the mouse was integrated. But most importantly, what does this all mean in an era of open innovation?
" ... Through the pioneering work of Henry Chesbrough and others, there is now widespread awareness and practice of Open Innovation as a means for companies to leverage inventions and innovations from external parties. This can range from simply licensing IP (from or to others) and relying on outside organizations to help you see what’s possible, to co-developing and leveraging someone else’s investment to be tailored to your needs. Simply put, open innovation institutionalizes and provides an alternative model for the uncharted do-we-or-don’t-we-let-him-in? model of a few decades ago. And why not? Drawing on one another’s strengths is a great way to not only reduce risk, but realize new opportunities, faster.... "
In the NYT. Making the case for eroding quantitative literacy. Even otherwise bright management is often mystified by simple math. So lets make that even more common? To make us fall even further behind the Germans, Russians and Chinese. Surprise, IT is more more important than ever, the recent debate is about who will bring what portions of it to the table, and what are the implications of that change? Is it good enough to be reactive? And what does preparation look like? Industry observers are fond of saying that the rise of tech consumerization, bring-your-own-device and the cloud are collectively sounding the death knell for information technology as we know it, but consultant Jonathan Hassell insists IT can provide more value than ever to an enterprise -- as long as businesses know where to look. According to Hassell, up until now, IT has done well as a high-tech reaction force, tackling problems as they come up before moving on to the next one, but that's not good enough anymore. Instead, he writes that IT departments need to become less reactive and more proactive by using their talents to create applications and services that provide value to the business..... "
In Mashable. a number of interesting examples of games in play at work. In GigaOM: On advanced uses of the iPhone and iPad. This leads me to thinking about tablets and smartphones as sensory devices. How can you provide information to the picture taker to make sure the right information is gathered? A frequent situation in the large organization. Because different areas are not seen as competent to recognize useful innovations in others. One answer is to have a multi-functional, experienced screening team to pass on useful ideas. Tom Davenport on new frontiers in health care via analytics. I agree, the frontier has arrived in the form of accessible data, sensors and readily available analytics.
" ... advances in information technology and emerging new processes in care delivery are setting the stage for “new decision frontiers,” Davenport said at Health Data Management’s Healthcare Analytics Symposium in Chicago. These include predictive modeling and scoring, checklists and care protocols, comparative effectiveness research, transparency around health care costs, and behavioral economics and nudges to change patient and provider behaviors. With data analytics, decision making is becoming more automated, he asserted. But the analytics being done today are on a small scale and just scratching the surface, such as identifying patients’ clinical and financial risks, protocol adherence, embedding analytics into daily practice, and analyzing physician and patient networks.... "
Have been following the use of social media by Procter & Gamble and others in conjunction with the Games. This article has a good overview of a number of efforts going on. Reading: Microstyle, The Art of Writing Little, by Christopher Johnson. About the rise of compressed writing in things like branding and social networks. So far this mostly deals with naming and branding for marketing as opposed to how you can do simplified writing. He also has a blog that covers the same territory. I have been exposed to very verbose styles, and much appreciate simplification, from the one page memo to outline forms, to concept maps and even tweets. Simpler is better. All but one major packaged goods company has exceeded sales expectations. Spending increases. The pressure is on. In AdAge. "At this year’s Gartner BI Summit in Los Angeles, Rita Sallam identified a new era of Hybrid (Big) Data Analytics. Hybrid data comes from structured sources like enterprise applications and unstructured sources (mainly text), like news feeds, social media, and documents. Next generation BI tools unify this data so it can be used for advanced data discovery, pattern detection and decision-making. What was previously only possible in Hollywood films is now business reality..... "
" ... To seek "unexpected advances" that could be applied to such situations, the U.S. Defense Advanced Research Projects Agency (DARPA) issued its Shredder Challenge in October 2011, daring the public to unshred five documents and extract their hidden messages. The puzzles were designed to be progressively difficult on multiple axes, ranging from about 200 chads to more than 6,000 each. Text files accompanying the scanned chads provided questions, with points reflecting each question's difficulty. For example, puzzle #3 asked "What is the indicated location?" while the reassembled document showed a set of geographic coordinates and a drawing of Cuba. (Naming the country was worth two points; the city of Cienfuegos was worth an additional six.) Solvers needed to both answer the questions and show how their reconstruction of the document led to that answer. More than 9,000 teams applied for the challenge, but only 69 of them answered one or more questions correctly.... "
Domain Specific Languages (DSL) have been proposed for years to bring the capability of computer programming to the non computing domain expert. By formulating and editing domain rules. We worked with them in the form of expert systems, where rules were seen as directly expressing expertise, and experts might edit them by themselves without technical help. Needless to say, that did not work as expected. There were too many complexities and unintended consequences to make it practical. ComputerWorld discusses DSLs. In New Scientist: Here using data that comes from Twitter. I mentioned worked we did some years ago that used over the counter sales data. Twitter data is probably much more real time, if it has the required accuracy. The AI text analytic method seeks to understand the form and contents of the tweets. No mention of its broader use to understand epidemic or bioterrorism conditions. In the latest Wharton Customer Analytics Initiative newsletter there are a number of videos from a recent conference that deal with mobile customer behavior. Here are the descriptions of the talks, the links can be found at the link above:" ... If you missed WCAI's conference, "Marketing on the Move: Understanding the Impact of Mobile on Consumer Behavior," or just want a quick refresh, the academic presentations are now available to view on WCAI's YouTube channel. Check out the talks from Felix Oberholzer-Gee (Harvard), Martin Spann (LMU Munich), Peter Danaher (Monash University), David Martens (University of Antwerp), and Sam Ransbotham (Boston College)..... "
In CIO: Can off shoring inhibit innovation? Only if it is poorly integrated with other corporate missions. In Computerworld: A good overview of the development of telemedicine using robotics from iRobot. Includes images of how this would be implemented. I suggest again that the embedded intelligence, not the mechanical robot, will be key to deliver this capability. Bedside manner will also be key. From Artefactgroup: A good overview of the subject. When we explored this we discovered that the devices were not very wearable in the context of performing maintenance tasks. This takes a step further if we expect them to be worn in everyday life. Are we ready for shopping in a post Pinterest world? Fluid HTML5 layouts replace the simulated shelf layout in old online retail. More here. Better I think than walking avatars through simulated shelves. An interesting example of the digitization of some 200,000 historical maps, which will ultimately give them much larger distribution and preserve them for the future. In the Edge: Looking at how people and animals socially interact and applying that organization more broadly. Akin to agent-based simulation methods we applied in marketing. Still being used today by companies like Thinkvine. Another exploration looked at how corporate organizational structures might be improved via restructure and acquisition. Does this work at ETH take the solution to new levels of social organization? " ... Society has many wonderful self-organization mechanisms that we can learn from, such as trust, reputation, culture. If we can learn how to implement that in our technological system, that is worth a lot of money; billions of dollars, actually. We think this is the next step after bio-inspired technology.... "
Walgreen's maps every store with a mobile application, but does not communicate it very well, writes Storefrontbacktalk. We worked extensively with store mapping applications, which show product via a search, route to their location, and other merchandising information. These were typically delivered via kiosk. We worked with Treosystem's iPal system, also now available for smartphones. LandSat imagery was the first example we saw of the value of images from space for business. We examined them for use in forest management for the pulp industry. Now Google Latlong has an excellent overview of what this data has meant, and links to a number of resources available, including some new ones they have put together. We have come a long way in resource imagery, and this was an excellent and inspirational start. Computerworld special edition on holistic virtualization. Increasingly important for the integration of analytics. Exploring. Former colleague Ted McConnell, exec VP at the Advertising Research Foundation, writes about the conundrum of blank display ads getting an impressive number of hits. And even a considerable ROI. He combines the investigation with thoughts of cosmic radiation and brings in an astrophysicist to check the numbers. Dear to my interests. As he says: Noise can easily confound our delicate signal. A cautionary tale, well told. We discovered in the very early days of the Web that the increasing access to more information made it very easy to feed your own biases. Ordinary employees and even advanced scientists were quick to find supporting information that supported their views, and did not always dig deeper to make sure it was correct. I recall researchers watching hours of videotape to find exactly those snippets that could be used with management to support their ideas. Everyone likes agreement. Steve King in the Small Business Lab blog covers the basic kinds of bias. Like confirmation and survivor bias. Another piece of information that every manager who works with data and analytics should know. Article quoted in length by MJ Perry. Saying that advances in robotics and artificial intelligence along with remote manufacture through 3D printing will drive manufacturing costs down in the West. I would add new analytics that allow the product to be efficiently linked directly to consumption need. Though I don't see how all this will not be used in China as well. The linked article and other references are useful. In Technology Review: What smartphones have replaced. I don't like lists for their own sake but I did notice the mention of a shopping list, which we studied in some detail. They have not yet been replaced by smartphones, but their functionality for doing more has increased. Many of the cases they show are similar ... the smartphone has increased the capability, but the basic function can still be done more simply. Engadget reports on a new technology for more accurately measuring local viewing activity via set-top boxes and watermarks. More information and press release at the link. Particularly interesting to me was the concept of a watermark. An invisible, but detectable code embedded into an image that can be interpreted by a sensor. We examined the concept for on consumer package and pallet scanning. Not sure if this is relevant to the Nielsen example, but does a watermark implicitly give your permission to be scanned? Also interesting is that this effort " ... will lay the groundwork to collect ratings for online, tablets and other platforms ... "
Nice piece on the history and implementation of John Boyd's OODA Loop.... The OODA Loop describes how to make decisions and act on them using a four-stage model: Observation, Orientation (perhaps better labeled Interpretation), Decision, and Action.... Every new hire should read this and remember it. In the NYTimes Mag: A breezy look at what has come to be known as 'visual curation' in systems like Pinterest . Asked by a connection to look at the relevance of Pinterest I set up an account and looked at how to link some of my blog entries there, while tracking hits and click-throughs. Can it induce different kinds of shopping engagement? How important is the visual element? It definitely gets a different cross section of customers 'walking in' than a blog, Facebook or Twitter. So is that curation? No, I don't think so, but it is establishing a store front on a different street, with strong visual cues. Go where your customers might be, especially if it is cheap and easy to do. Macy's promotes mobile shopping for coeds using Shopkick. In their blog. Exclusive deals and rewards for simply walking into one of their 800 US locations. An example of a major retailer using location based merchandising using Shopkick. Their catch phrase: is treat yourself while shopping. The Stroop effect is a clinical test that measures differences in reaction time when you are shown information that confirms or contradicts your own views, conscious or nonconscious. It has been used in neuromarketing studies in retail. I am skeptical about its direct usefullness. Here the suggestion is made that the conflict between data itself and associated metadata can have similar effects. The thought is interesting, but I have doubts that a mere timing difference is significant. In GigaOM: Freemium, the model of providing valuable, but limited in some way services free to attract large numbers of 'eyeballs' with the opportunity to up-sell, has been a wildly common and successful economic model. Is the model done now, and will new models need more direct value exchange? I was inclined to think so previously, but it seems to have become even more common. Just had need to go back and use Google+ again. Had been noticing a number of things written about its demise. Also this article warning it was not quite dead yet. Agree with some of the points about its simplicity has value. I also use Facebook relatively infrequently, and I find that its complexity has grown to the point that it is hard to re-learn when re-visited. Google+ is fairly easy to use when needed. But can it compete with Facebook and Twitter with critical mass? Or is it just for specialist groups? A piece in the WSJ by the Numbers Guy about a recent study regarding how too much sitting could cause an early death. Well done, a classic correlation vs causation example that should be shown to all management for required reading. I see too many examples like this. A series in SAS Voices. Which looks at how math is used in industry and at home. And how it relates to business analytics. Great to point out to students who may not understand how math relates to real jobs. Colleague Herb Sorensen comments on the use of eye tracking by CPG companies in RetailWire. True,this has become common, and more analytical work is needed. " ... What has become apparent is that visual control, and a whole lot more of the shopping trip, is NOT consciously managed by the shopper, but is under autonomic control. This, in turn, has led me to more in-depth study on the neurobiology behind the guidance/response mechanism, THE fundamental science of the purchase process ... "
Mark Perry points to updates from the Coursera free online college course syndication .... including the mention of one at least from always provocative Dan Ariely. From a number of universities, including some I have spent time at. Worth examining for content that matches your needs or interests. Have heard of this, but never tried it. Plan to. I was sent a note about a new company formed by a former colleague of mine, Suna Polat, who worked with knowledge management projects at my former enterprise. Winnovate1. Check their site out. " ... to assist organizations in the development and implementation of their strategic innovation initiatives. She specializes in consulting for organizations that are pursuing Open and Social Innovation strategies. In addition, with her deep understanding of customer needs, Suna advises digital technology companies that offer platforms and tools for Open and Social Innovation.... "
Social integration of search Is mentioned as being deepened by Bing and Google+. We examined this general idea for some time as it related to corporate knowledge management. There is a company that does exactly this: Zakta.com. Which aims to link search, probably one of the most common elements of business process done today, to collaborative business focus. In the early days of executive information systems we first dealt with the questions of whose data was right? All data is imperfect, but what are the consequences of that imperfection when fed to an analytic model? The issues are discussed. " ...an executive from a large analytical software company said something interesting that stuck with me. I am paraphrasing from memory, but it was very much to the effect of, “Sometimes it’s better to have everyone agreeing on numbers that aren’t entirely accurate than having everyone off doing their own numbers.” ... "
In a new development, brands can communicate to their most frequent check-ins via Foursquare. Making the interaction bi directional in useful ways has been talked about for some time, but recent updates now allow it to happen. " ... The tool has the potential to give brands a reason to actively manage Foursquare -- which had lacked a CRM component -- that they didn't have before, according to Rob Reed, founder of the location-based marketing platform MomentFeed, which has clients such as Cinnabon and Chili's.... "
Not unexpected. CPG often lacks in their following of many technical innovations. A good case study of the use of APIs at Walgreens for photo prints. Simple ways of bringing digital into physical spaces. TELLNGO is an innovative Consumer & Shopper Marketing Service Agency. We specialize in enhancing Trial, Conversion, Purchases and Loyalty for some of the largest and best known consumer brands in Beauty, Health and Household Care through 1:1 Digital Relationships with Consumers & Shoppers. Our comprehensive set of Online & Mobile Apps allow consumers & shoppers to Connect with Brands and Retailers Anytime, Anywhere - whether they are Online, In-Store or On The GO! Have been looking at the topic of open innovation lately. How about radical openness? A post by former colleague Donna Sturgess. Local manufacturer NCR, inventor of the the modern mechanical cash register, is in pursuit of Square,with what they are calling NCR Silver. Lots of groups in play now for mobile payment solution variants.We worked with NCR in point of sale and self checkout solutions in our retail laboratories. Good overview article. Some neural fingerprints of memory are decoded. A first tiny step towards experimentally verifiable results like neuromarketing, neural control and memory interfaces. Having them come from memory further increases the implications of brain to behavior links. Can nonconscious interactions be far away? I still think this is some time in the future. I have been a long time practitioner of business analytics, the use of quantitative methods to improve business processes. Starting at the Defense Department, where we built military simulation models, and ending up at P&G. My first project there, when I arrived in 1977, was to improve warehouse efficiency using IBM's mathematical programming system: MPSX. That followed with using the same mathematical optimization approaches for scheduling, supply chain siting and executive decision making. So I was happy to see in the July/August Issue of Analytics Magazine an article by Arnold Greenland on the history and current state of business analytics at IBM. This allows me to reflect on the growth and impact of analytical methods at IBM and elsewhere. Since then the original MPSX package has disappeared, and has been replaced by the acquired Ilog/Cplex, which goes far beyond the original package, adding nonlinear methods as well. Shortly after being introduced to MPSX, in 1980, we addressed the analysis of unstructured data, typically consumer comments in unstructured text, using recently developed methods called 'Content Analysis'. These permitted the semantic analysis of multiple human languages. An early attempt to look at and understand unstructured 'Big Data'. During all of this time we also used a number of statistical methods throughout the enterprise to explore and improve systems. SPSS and SAS were in frequent use. A package called Clementine allowed us to use advanced logical methods, like artificial neural nets, to implement what were essentially statistical methods, to store and implement specific decision rules. These methods could then be inserted in both software and hardware processes. Clementine also permitted the structural exploration of the decision process. Ultimately Clementine was acquired by SPSS, and were eventually absorbed into Modeler. During the 1990's, a heady time for artificial intelligence, we implemented expert systems using a now defunct language called M1. Which were successful for a number of complex industrial management processes. Some of the same capabilities can be seen in JRules. That work has been extended into recent AI explorations like that of IBM's Watson. What is further interesting now is that many of these methods are now available to the small and medium sized business. We live in a time where the tools are available, just go out and use them. FromWharton: A March madness of innovation? I am not sure it works well for innovation, since crowd sourcing the measures to evaluate innovation results are not precisely what you want. Yet it is worth considering. Perhaps as a screener of initial proposals? I have seen some interesting things out of Greenplum. They have just announced an analytics blog." ... Datastream, Greenplum’s official blog, delivering analytics news and exploring emerging data science trends. A piece in Singularity Hub on the temporal search in the forward looking search engine Recordedfuture, which I have now followed for some time. It now has a new user interface in Beta, which provides a timeline-style interaction, improving its temporal style. Fast Company on P&G's Connect & Develop Approach. Good article on the purpose and direction of P&G's outsourcing of innovation using Connect and Develop. I would suggest that anyone who has ideas they would like the CPG giant to work with look at the site. I have worked with startups and vendors seeking this connection for nearly ten years, and the idea is great, but the execution often lacking. From Mindjet: Good overview of the concept of immersing yourself, and your business teams, in your data. I have covered the broad idea a number of times. As PC use declines, we still expect to be in touch. Our devices call us to attention. We share the devices with personal communications and the difference blurs. They make it easy, 24/7. But this can decrease focused productivity. You still have to have time to think unconnected. An article in the NYT discusses this. Describes a number of experiments that have forced people off wireless to test the idea. PC Sales are decreasing. Good statistics. Traditional sales leaders like HP and Dell are getting hit with the expectation of the company and worker that software solutions will be available on convenient mobile devices. . Workers expect the access. The Cloud will provide the data. Solutions have been broken up into bite sized pieces that are increasingly interchangeable. The office is virtual. The direction is inevitable. In GigaOM: Not much detail here, but lots of players mentioned. It is not only the idea of Big Data, but sometimes even just some data, intelligently sharing data, and most importantly, doing smarter things with it. Good interview with Alan Kay. Developer of Smalltalk. We talked to him long ago about the use of 'object oriented' methods for making development more efficient. That worked, partially, but has not yet brought development capabilities down to the 'people' yet. its still complex and technical. Inspirational speaker and writer. Kay is now at the Viewpoints Research Institute, which gives you an idea of some of his recent work. The Institute talks about Design for Learning. Anyone who runs a blog has noticed that there are sharply increasing amounts of Spam being received. I approve all comments to this blog. I cannot approve anything that is written in any language but English and German. So if it is that important, have it translated. Also I will not approve anything that does not contribute to the conversation substantially. 'Nice post' does not qualify. I will only rarely approve anything with a link in it, unless I am sure of the source. If you want to personally communicate with me, sending a note to my comments asking to communicate sometimes works, but also sometimes gets lost in the traffic. Use my email address. There are also some trolls out there that seek to harass me via comments, shame on you. Cooking information like recipes are a typical currency exchanged in families. Now that is being replaced by online resources. I have noticed that in my own cooking relationships. Another example of how social information exchange is changing. A further archiving of our landscape. Very nicely done. Tour the parks from your armchair. As an amateur botanist this allows me to link to specific plants, though I would further like to get a view that is more plant centric than street centric. Check it out. Based on the kinds of things I have seen in the press lately, and the increasing need for content to fill so many empty spaces, perhaps it is inevitable. Steven Wolfram looks back at the publication of 'A New Kind of Science', which we examined ten years ago as a means to model certain kinds of group interaction. At that same time we were utilizing artificial neural networks as a form of learning networks to replace sensor arrays. Typically those that represented people. Wolfram's thick book is still worth reading, at least the first few chapters, and this review gives a reflective look back where he suggests how the metaphor might be useful in the future. We live in a world that will increasingly bring sensors, experts, databases and models of many kinds closer together to provide help to the decision maker. And that decision maker will increasingly be all of us. A look by Technology review on one aspect of the model, using medical visualization to bridge part of the gap. And more R courses for data visualization and analytics. In this case it is more about new methods being made available that will soon be in the toolbox of the data scientist. See in particular, notes about new data visualization methods and data warehousing ideas. The latest on customer rewards programs from Progressive Grocer. The overall return on investment has been increasing. The sophistication of the methods to focus on returns seems to be paying off. AnalyticsBridge posts the particulars about the online 'Georgia R School', available for as little as $110. The R stat and visualization package is becoming increasingly popular for applications, many students are coming out of school knowing it, and many new methods are being built into its libraries. But it is tricky enough to need some up front training for those that did not get it in school. The curriculum here looks to be very good for starting out with some statistics background. I also suggest joining Analyticsbridge, which often has gems like this. I sometimes pass them along there. ... Plus, I note, lots more course ware is available in the coming year. Nielsen launches ad effectiveness innovation lab. " ... The Nielsen Innovation Lab will incorporate assets from across the Nielsen group, along with external resources – from clients, industry groups and academia – in a bid to enhance understanding of the value of advertising activities across media platforms.... "
In the WSJ: Continued advanced usage of eye tracking to understand the shopping consumer. Some very interesting detail is included in this article. " .... companies likeProcter & Gamble Co.,Unilever PLC and Kimberly-Clark are combining three-dimensional computer simulations of product designs and store layouts with eye-tracking technology. And that, in turn, is helping them roll out new products faster and come up with designs and shelf layouts that boost sales ... "
In Consumer Goods Technology: Safe water approaches seem to be coming popular for large consumer goods companies. Admirable effort, and the Facebook connection is worth looking at.
" ... Unilever, through the Unilever Foundation, in partnership with PSI (Population Services International) announces the launch of Waterworks, a non-for-profit programme that will provide safe clean drinking water to communities in need around the world. Waterworks, which operates through a Timeline application developed jointly with Facebook, will connect people with means directly with people and communities in need.... "
From Kioskmarketplace: This reminds me of the considerable work we did in our retail lab well before the emergence of the smartphone. Kiosks were the rage, and we were loaned several to use them in the aisle, mostly for prepared food ordering. Now are they mobile POS? Or will this eventually evolve to shopper owned Bring-your-own-device smartphone scanners? Link via Kevin Judd.
" ... The store of the future will not feature long check-out lines or any lines for that matter, according to retail experts and a recent survey from CompTIA predicting that traditional point-of-sale solutions will soon look archaic. Although only 13 percent of retailers polled said they're currently testing a mobile POS, another 19 percent said they will begin tests in the next 12 months. And that number will steadily climb over the next few years as retailers look for ways to provide customers with faster and better service, said John Kenney, SVP of business development for Stella Nova Technologies Inc. ... "
Check out the IdeaConnection blog. They are writing about Amway and Open Innovation. " ... Since 2005, global consumer goods company Amway has launched 17 high-impact products in 55 markets and generated more than $700 million in revenue. And the credit is largely due to its engagement with open innovation. Open innovation is not everyone’s cup of tea. There are still many companies hunkered down between their own four walls wanting to keep things the way they are, steadfastly refusing to engage with external expertise. But OI is rapidly becoming the norm and to those who are still unsure about its benefits new research by Frost & Sullivan may allay fears and answer questions ... "
In Adage: Kraft doing innovation via Fly Garage for Latin America, with some similar goals to other innovation centers that I have worked with. " ... Making the Trident brand fun was the mission when Kraft Latin America's Maria Mujica led the company's first Project Fly last November, launching an ambitious innovation incubator for digital projects in the region. Now Kraft is opening the Fly Garage, a permanent home in trendy Buenos Aires neighborhood Palermo Soho for the two-week immersion sessions that will bring together Kraft marketers, agencies and other collaborators like Hyper Island to focus on a single brand and its challenges. I had long ago involvement with DARPA, they are building up their large scale data involvement. An example: Military Transformers: 20 Innovative Defense Technologies (click image for larger view and for slideshow) The Defense Advanced Research Projects Agency is planning an unusual eight-week residency program in which teams of researchers brainstorm over ways to use visual and geospatial images to identify people, places, objects, and activities .... "
Brian Lewis guides us on a tour of collaborative forecasting, which enables companies to transition from periodic, disparate, and isolated forecasting activities to a single, real-time enterprise forecasting process. Jack Yurkiewicz provides interesting trends, new developments, and valuable data from the 2012 forecasting software survey and directory of forecasting software vendors. Gary Cokins compares skeptics, who are typically older and shaped by managing when errors were tolerated, with enthusiasts in the analytics and big data arena. Subir Mansukhani delves into the predictability of time series. He shows us a statistical measure used to classify time series and infer the level of difficulty in predicting and choosing an appropriate model. In IEEE Spectrum: A whimsical robot takes inventory in a bookstore. " ... has bigger plans for the future, where "in-store robots might handle tasks such as folding clothing items, stocking shelves, and helping customers to locate items and load their purchases into their cars.... "
GigaOM writes about showrooming, the increasing tendency of shoppers to experience a product at a store, and then buy it online or elsewhere by searching or scanning it to compare prices and features. We saw this tendency early on during experiments with a major retailer. The example of Best Buy is used in the article since electronics and computers are a typical example where the practice is common. Good statistics are provided. Is there a solution for the physical retailer? One suggestion is that store create better experiences, akin to the Apple Store, that engage the shopper with the experience, and more naturally lead to purchase. How is the magic best introduced in physical locations? Augmented reality experiences? Or online? Show happy people interacting. Trust and followup support and service are other key components of expensive and complex purchases. So making these aspects as seamless as possible is another component that can differentiate the interaction. This works best for some products, less for others. Once in the store the shopper should also be advised of all the associated capabilities, add-ons and accessories needed to make the purchase successful. And afterwards need to be reminded of where they made the purchase and the magic of the experience. Following the issue and potential solutions closely.
" ... Business Intelligence is a necessary component of your organization. However, the frantic pace at which the world of business is evolving may make you feel like your company’s business intelligence solutions are a bit antiquated and out of touch with what your organization needs. It is time to begin a discussion about the practicality of employing Agile BI strategies and tactics. The generally accepted definition of Agile BI is: a rapid development methodology that solicits end-user input early and often and delivers BI systems fast, making the entire process more interactive and responsive..... "
Surprising statement on the face of it, from the HBR. Bottom line, it makes you more sensitive to feedback, and the ability to adjust your approaches to be more successful. A rarely examined cost. Some stats I have seen nowhere else. " ... From confidential customer information, to intellectual property, to financial transactions, organizations possess massive amounts of information that must be collected, retained and analyzed to keep the business competitive, but it comes at a huge cost, according to security specialist Symantec's State of Information Survey. Digital information costs businesses worldwide $1.1 trillion annually, the report found, but also makes up 49 percent of an organization's total value.... "
Mind Hacks takes a hack at Neuromarketing. I think there is something to be considered here. There is value in trying new methods to augment traditional ones, but just cryptically invoking support is not enough to make you depend on them.
" ... Neuromarketing is the study of the neuroscience of marketing – a genuinely interesting field that, contrary to what neuromarketing companies will have you believe, has absolutely no practical benefit at the moment because no-one has yet demonstrated that a neural response is a better predictor of the key outcomes than a behavioural response. This, however, is more like neuro-spin-marketing, as it relies on people believing the hype of neuromarketing to get branded pseudo-studies into the media.... "
A Seattle startup that seeks to deliver smartphone enabled scanning and retail checkout. More detail at the Qthru site. We examined this approach a number of times, its advantage is that it can utilize the shoppers own devices. Retailers have to opt into the infrastructure and details of the execution. And ultimately decrease labor costs. Shoppers have to have the smartphones and be trained in their use for these applications. A number of large retailers are looking at this approach. Via Stan Dyck. See also related products from, Aislebuyer. Reconnected this past week with PowerHouse Factories. Impressed by their linking branding with data and analytics. Build the brand, but immediately link in how you plan to improve the brands operation. And utilize all the social connections possible to make that work. Makes sense.
" ... The fundamental relationship of brands and consumers has changed. People are asking more from their brands: to be more connected. To be more conversational. To be more relevant to their everyday lives. To be more human. Or as we like to think of it, Culture-Led, Data-Fed Brand Building. Most companies do one or the other – we can’t imagine one without the other. Neither one alone can paint a complete picture. Culture-Led: anticipating trends and uncovering insights, often using some of the most unlikely methods. Our Factory model keeps us a little ahead of the curve, yielding insights that have helped clients in laundry detergent, micro-brew beer and flooring to name a few. Data-Fed: businesses and brands now have more data than they often know what to do with. We lower the signal-to-noise ratio to find the deeper patterns: rich segmentation, which products to put on sale, when to open that extra cash register to improve the shopping experience, and how often to run a coupon. Brand Building: armed with insights from culture and data, we put them into action: brand architecture, co-creating a new product, identity development, brand meaning, social media, blogger conferences, digital advertising, skywriting – we’ve got your back.... "
QR codes showing up on all book covers of some publishers. Like Simon and Schuster. Not unexpected as more consumers are getting used to seeing the codes in many places. Makes sense to continue to re-market using the devices of the newly empowered consumer. In the NYT: A number of recent examples have shown that the crowd, as exemplified by well known wisdom aggregations like Intrade, is not always correct. Sometimes you are much better off with experts in a focused area than just a broad opinion with the wrong incentives. The press is an aggregator of expertise, and of crowd wisdom, but it often does the aggregation driven by the wrong reasons. In Forbes: Microsoft example. I am inclined to agree, an approach that strictly forces grading on a curve tends to make people less creative, take fewer risks, and not talk openly to their management. Not sure how much this really made MS less creative, but can only have hurt them. In my own interaction with MS innovation groups I found them very creative, but too cautious in delivery. In our own enterprise we were allowed to be creative, as long as that creativity did even slightly risk key touchstones of delivery. I have not been particularly fond of the public Tweet chat, an organized interaction between vendor experts and anyone who wants to join in. But lately I have participated in a few that have been enlightening. What is nice is that you get a record of the interaction via the chat's hasthtag stream. Here is one that is upcoming, run by the IBM X-Force Security Team. If you have not done a tweet chat, this is a good example. Emphasizing the Bring Your Own Device (BYOD) security interest for the mid market firm. I plan to attend. On Tuesday 7/10 at 2 PM EDT. http://goo.gl/bDVeL @MidmarketIBM Why?
" ... Sales of smart phones and tablets now outstrip PC sales by more than 2:1 in North America, and that gap is only going to become wider as smart mobile devices go mainstream. The popularity of the Apple and Android platforms has made BYOD (bring your own device) a reality.Business mobility has moved beyond e-mail and into the new world of apps. Business users want to configure and customize their phones for their unique needs, and IT organizations are under pressure to support and enable this choice. This new scenario has created an uncertain security environment for IT managers. Windows and MacOS are mature platforms with a robust ecosystem of security solutions. That isn't yet the case with the new mobile platforms... "
Now Apple has also entered the fray with a patent on head-mounted display technology, with a different approach. In Slashdot. In the next iPhone? If only it could be done with an App. In Medgadget: From LifeWatch AG (Neuhausen am Rheinfall, Switzerland) An Android smartphone packed with medical sensors. Quite remarkable: " .... The tests include one-lead ECG, body temperature, blood glucose, heart rate, blood oxygen saturation, body fat percentage and stress levels as expressed by heart rate variability. Each medical test is presented as an application and, in addition, there are diet applications and programmable reminders for medications. All collected data is automatically and securely saved to a remote server and can be retrieved from the cloud for follow-up anytime, anywhere. Results and historical data can be shared with doctors, family or others on the user’s request through e-mail or text message..... " . Carry along sensors, which can construct a two way communication with the patient, and inform others in their medical 'circle', is quite a breakthrough. Though it is apparently not yet available.
" ... Most companies have massive amounts of data at their disposal, yet fail to utilize it in any meaningful way. But a powerful new business tool - analytics - is enabling many firms to aggressively leverage their data in key business decisions and processes, with impressive results. In their previous book, Competing on Analytics, Thomas Davenport and Jeanne Harris showed how pioneering firms were building their entire strategies around their analytical capabilities. Rather than "going with the gut" when pricing products, maintaining inventory, or hiring talent, managers in these firms use data, analysis, and systematic reasoning to make decisions that improve efficiency, risk-management, and profits.... "
In Wired: Fighting leaks with the spread of believable misinformation. This is a very old idea, but using systems technology to do it effectively is not. A blog devoted to Data Science, and apparently often concerning Big Data: Data Science 101: Learning to be a Data Scientist. Short and generally accessible articles so far. Junaio has updated their mobile App capabilities for commercial augmented reality. Full report accessible here. Also see a short video explaining mobile augmented reality. New capabilities include scanning images, barcodes and QR codes. With an easier to use interface. I like the idea, but it depends heavily on accessible content, and there isn't much available in my suburban location. Even the Web was not impressive until you had sufficient value to search for. From Work at Rice University. Including power delivery from a surface that could be charged with solar. Not quite ready for application, but the portable delivery of power is an increasingly important capability. A third of US homes, like my own, are now cellphone only. Not unexpected, the trend has been moving quickly. Plus other revealing statistics. An interview with Andrea Phillips. Fascinating thoughts, especially about gamification and the continuation of expressive story in marketing. " .... Our current multi-channel, multi-screen, "always on" world is giving rise to a new form of storytelling, dubbed "transmedia," that unfolds a narrative across multiple media channels. A single story may present some elements through a television series or a motion picture with additional narrative threads explored in comic books, video games or a collection of websites and Twitter feeds. Depending on their level of interest, fans can engage in selection of these story elements or follow all of them to fully immerse themselves in the world of the story. ... "
A set of videos on driving conversations using Google Analytics. Nicely done. " ... This new video series features our Analytics Advocate Justin Cutroni. He provides insights into how to use goals, AdWords, and Multi-Channel Funnels within Analytics to make better decisions for your website.... "
Ever since being able to log into systems from home, the trend of extending the work week has progressed. Now some actual data on how data mobility as taken it further. A full day for 80% of the work force. Amazon buys UpNext. To make a play at 3D mapping. " ... UpNext, which had apparently been pursued by other major tech companies, has launched apps for the iPad, iPhone and Android devices. It covers 50 cities nationwide, and, for 23 cities, it offers enhanced details. It’s also partnered with the NFL to develop Super Bowl guides that include 3D maps of the stadium and surrounding area. Through the apps, users can virtually drop down onto city streets and tap their way to more information about buildings and different views of the area. The dynamic maps also provide point to point directions..... "
Currently taking a closer look at DARPA XDATA: " ... To enable large scale data processing in a wide range of potential settings, XDATA plans to release open source software toolkits to enable collaboration among the applied mathematics, computer science and data visualization communities ... "
In Adage: Have not seen IBM involved on the shelves of retail for a while. This is an interesting effort of theirs in testing the experience of in-store interaction. We worked with their early use of kiosk and checkout experience. " .... Marketers have tried targeting consumers in stores with QR codes and barcode scanners that so far have gotten limited traction. 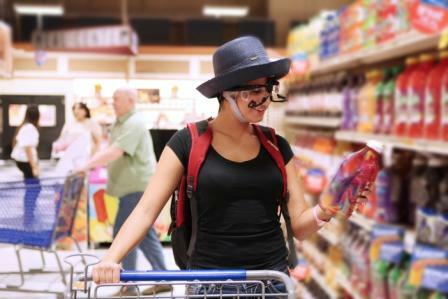 Now IBM is testing a new approach, dubbed augmented reality, which is a bit like applying search or a personalized version of Google Goggles to the world of physical store shelves. The prototype app, being tested with some yet-unnamed large retailers in the U.S., can be downloaded by shoppers in-store at the onset of a shopping trip or beforehand to their smartphones or tablets. It lets them describe what they're looking for in terms of ingredients they want more of (e.g. whole grains) or less or none of (e.g. gluten or lactose). It also lets them input that they want biodegradable packaging or say what ingredients or products they want to assemble for a meal.... "
In the NYT: An article suggesting that systems like Google Project Glass, once they are implemented well, will be a major shift that puts tech into the background. The article surveys such long ago innovations like those of Gutenberg and Aldus Manutius, and how it was the secondary enabling changes in technology that ultimately led to very big changes in culture. The case is made that this latter change, Manutius's development of the pamphlet, was like the smartphone. I agree about Google Project Glass, and similar implementations. This could make it much easier to provide the connectivity at all times and all places to make us knowledge interactive. Systems like always connected smartphone and tablets and voice enabled intelligence and search are early steps in this direction. Dividing your attention with wearable computing will also be an issue with intercepting our visual interaction. We will see once again videos of people like those walking into a fountain while texting. Nike comes out with Stat tracking shoes. I had a talk with a person recently involved in the use of sensors and data gathering and analysis in athletics, and I was amazed by the progress that had been made there. This is another great example, expect to see many more examples in other places.